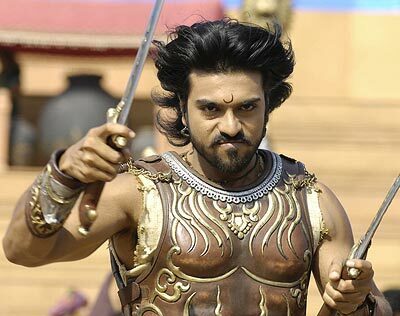 The Telugu film Magadheera is a keenly awaited movie on many counts. Firstly, it is Ram Charan Teja's (megastar-turned politician Chiranjeevi's son) second film. It's directed by SS Rajamouli, one of the top and highly successful directors of the Telugu industry today. It's touted to be one of the costliest extravaganzas. MM Keeravani scores music for this 'part-period' film. It's shot by Senthil Kumar, a man known for his innovative lighting patterns and camera work. It's styled by Rama Rajamouli, wife of SS Rajamouli and of course written by none other than Vijayendra Prasad, father of Rajamouli. Moreover, the film has been in the making for quite some time. So that's enough curiosity incited for its opening. Ram Charan's first film was Chiruta. Both Chiruta and Magadheera have been directed by hotshot directors of the industry namely Puri Jagannath and Rajamouli. 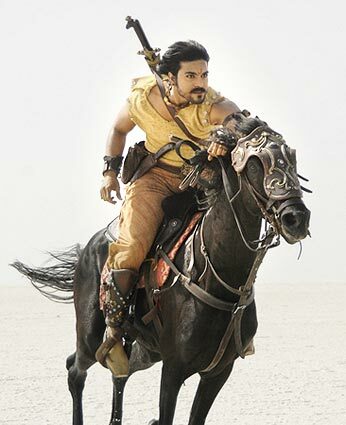 As Rajamouli's films have quite a bit of action in them, Charan is said to have learnt horse racing for this film. So audience can expect Charan flexing his muscles too. Kajal Agarwal shares screen space with Charan in Magadheera. Just a few films old, Kajal is inching up the glamour and acting ladder. It remains to be seen if the pair's chemistry will rock the screen. Nothing much of the story has been revealed so far though the buzz is that it's to do with love and reincarnation. A love story set against an action backdrop. Rajamouli ensures his films have enough masala in them to make them high-voltage commercial entertainers particularly for the masses. In scripting he is ably helped by his father. The second time around, the film seems to be a part period, part present film as Senthil Kumar, the man who shot the film says. "It will be a landmark effort (Senthil shot the blockbuster Arundhati too) which will show on screen." Given the fact that Rajamouli and Senthil have worked together in previous films (Sye, Chhatrapati, Yamadonga), both share a good rapport and their effort is likely to mesmerise viewers. Keeravani is a constant in Rajamouli's ventures as far as music goes. The audio was released on June 28 at a grand, gala function. It is needless to say Keeravani does a good job when it's a Rajamouli's film. The megastar Chiru himself is said to have danced to the remixed version of Bangaru Kodipetta (a song from his earlier film Gharana Mogudu) along with his son. Daler Mehndi has sung a song in this film. Magadheera is produced by Allu Arvind (Chiranjeevi's brother-in-law) under Geetha Arts banner which reaped good profits with Aamir Khan's Ghajini. Srihari is said to have play the villain in the movie. Everyone was curious to see Ram Charan in Chiruta and the film ran for 100 plus days. So Magadheera is the litmus test for Charan. Will the son emerge victorious and chart a course similar to the father's destiny? Wait till July 22 when Magadheera opens in theatres!